Happy October everyone! Can you believe it’s already October? The year is nearly over – oh how time flies. To celebrate this spookily festive month, I thought you might enjoy LDN 673. Also known as Lynds’ Dark Nebula 673, this is a haunting nebula located some 400 light-years from Earth in the constellation of Aquila. 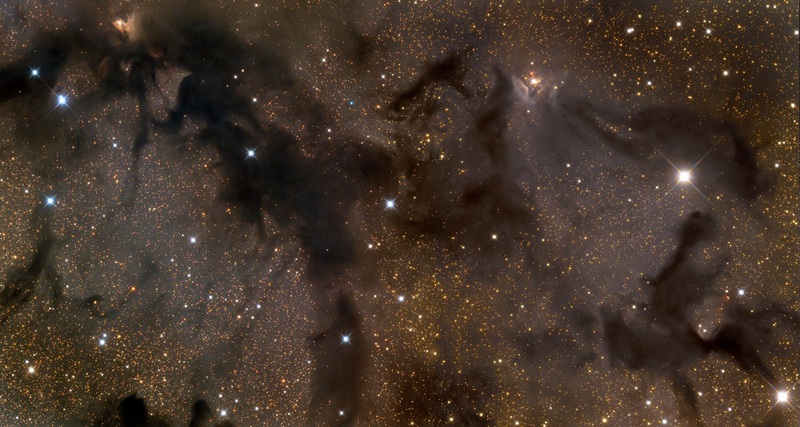 The nebula itself is situated in the center of the Aquila Rift, which comprises a dark molecular cloud – containing several dark nebulae. This particular region is home to enough material to spawn hundreds, perhaps even thousands, of baby stars. But since the region is dense in obscuring interstellar dust grains, the number of stars that are already in the process of forming remains unknown. To get down to the bottom of the matter, astronomers probed the region using special tools – tools that are able to peek inside the stellar nursery, to reveal the ongoing activity inside of the clouds. One tell-tale sign of stellar activity comes in the form of energetic outflows; stellar winds emanating from a small, red-tinted nebula; known as RNO 109 (pictured in the top left). Another nearby nebula, called Herbig-Haro object HH 32, also exhibits signs of activity. Overall, the nebula spans a stunning 7 light-years across. I use this comparison regularly, but it’s always effective. So, to put this number in perspective. Our closest celestial neighbors are in the Alpha Centauri triple star system – located some 4.3 light-years from Earth. Light could travel from our solar system, to it and (almost) back, before light could travel from one side of this region to the other.